Synopsis: The Hobbit: The Desolation of Smaug continues the adventure of the title character Bilbo Baggins (Martin Freeman) as he journeys with the Wizard Gandalf (Ian McKellen) and thirteen Dwarves, led by Thorin Oakenshield (Richard Armitage), on an epic quest to reclaim the Lonely Mountain and the lost Dwarf Kingdom of Erebor. Having survived the beginning of their unexpected journey, the Company continues East, encountering along the way the skin-changer Beorn and a swarm of giant Spiders in the treacherous forest of Mirkwood. After escaping capture by the dangerous Wood-elves, the Dwarves journey to Lake-town, and finally to the Lonely Mountain itself, where they must face the greatest danger of all—a creature more terrifying than any other; one which will test not only the depth of their courage but the limits of their friendship and the wisdom of the journey itself—the Dragon Smaug (Benedict Cumberbatch). Review: Peter Jackson is in an enviable position – the first Hobbit movie, An Unexpected Journey, had already clocked more than a billion dollars in revenue, effectively paying for the entire franchise. 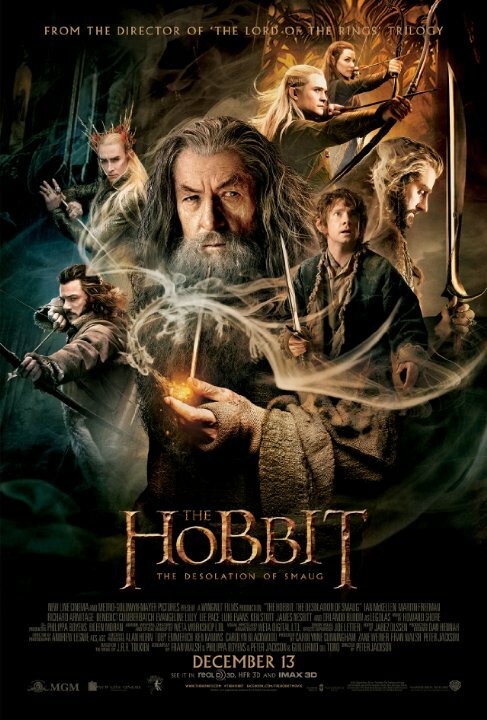 Any box office takings for Desolation of Smaug and There and Back Again is pure icing on the cake. Perhaps if this was anticipated beforehand, there wouldn’t have been a need to draw out the film adaptation into three installments instead of the originally-planned two, because although The Desolation of Smaug is better than An Unexpected Journey, what cannot be denied is that there is a massive amount of bloat in the franchise, which is even more apparent in this second outing. Instead of being true to the novel, what Peter Jackson has done is to use the source as an outline for the movie. In fact, half or more of The Desolation of Smaug is not found in the novel, with entire sequences and characters being crafted from the collective imaginations of the writing team and from the notes of Tolkien himself. Splitting such a short book into three three-hour excursions has necessitated this, and plot wise The Desolation of Smaug is about as spare as it can get. It’s a telltale sign when the most interesting and well-developed character is Tauriel (Evangeline Lilly), who is not even part of the novel, and the remainder dwarves are still as featureless and unmemorable as before, excepting Kili (Aidan Turner), who is really only made interesting because of his involvement with Tauriel. The ostensible leads of Gandalf, Bilbo and Thorin are stagnant in terms of character development, and the actual plot development is minimal – in fact, one can simply sit through just the final 30 minutes of The Desolation of Smaug and be completely up to speed with the plot leading into There and Back Again. That is not to say that The Desolation of Smaug is a bad film by any measure. Peter Jackson showcases his mastery in action sequences, and there are a number of action set pieces that are extremely well done in the film, particularly the water barrel sequence involving Legolas (Orlando Bloom, who unfortunately looks older despite playing a younger version of Legolas) and the showdown with giant spiders. The visuals presented in Jackson’s vision of Middle-Earth is as stunning as ever (I’m still undecided on whether HFR is a good or bad thing, however), and Smaug, finally unveiled in his full glory, is a marvel of CG imagery. However, there are just as many segments in the film that drag, particularly the hour between the water barrels and Smaug’s appearance, and only the most ardent fans or tolerant moviegoers would not feel some sort of impatience at the plodding pace. And of course, it then ends abruptly, giving no resolution to the storyline till the next installment in December 2014. While most people would have had some inkling of the plot progression and the series’ conclusion, the lack of a conclusion of any sort may still frustrate some audience members. Perhaps the biggest problem with The Hobbit franchise is the impossibly high standard that Peter Jackson and crew had set with Lord of the Rings. While The Hobbit bears a resemblance to that franchise, it is plagued with problems that the three Lord of the Rings movies did not face, particularly the paucity of the source material and the desperate attempts to pad out the films to justify a trilogy. Somewhere beneath the bloat is an excellent movie (or two, at most), and one hopes that instead of a further extended edition heading to home video, that Jackson and team would be able to produce an abridged version that will distil the films into a more refined whole. Good review. Better than the first, but not by much. However, I had fun with this though.